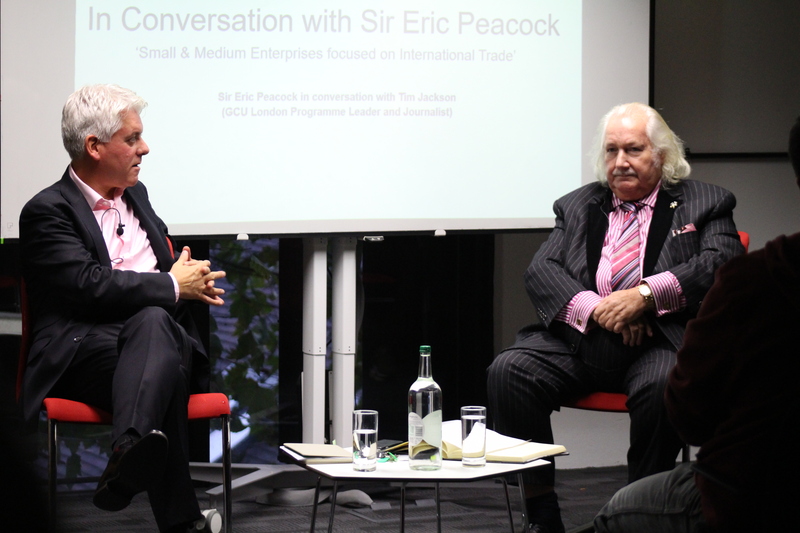 On Thursday 12th October, GCU London welcomed Sir Eric Peacock onto campus.Tim Jackson (MBA Luxury Brand Management and MSc Luxury Brand Marketing Programme Leader and Journalist) hosted an evening of discussion on ‘Small & Medium Enterprises focused on International Trade’ with the renowned entrepreneur. The event proved extremely popular with our students with further seating required to accommodate the additional turnout! Sir Eric Peacock was knighted in 2003 for his services to international trade. He is currently a non-executive director of the management board of UK Export Finance. 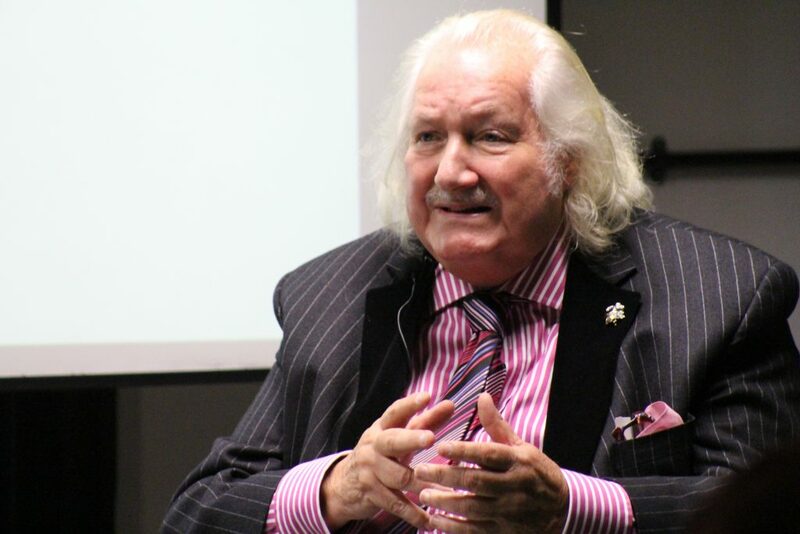 Having worked in New Zealand, Australia, USA, Hong Kong, UK and Ireland and leading companies since 1970; Sir Eric’s experience is wide-spread and eye-opening. His involvement with international trade ranges from consumer goods and industry supply chain, to management development and success in growing and selling businesses. Amongst the companies he chairs are Baydonhill FX, Stage Technologies Ltd and Cimex. On top of this, Sir Eric is President of Institute of Sales and Marketing Management and also leads Peacock Foundation and Uniqueness; two charities that focus on disadvantaged children and young adults. During the discussion, Sir Eric Peacock talked about his impressive history with Small and Medium Enterprises (SME); covering the ups and downs of his career and the challenges of SME. Sir Eric also provided insightful tips on what to do, and what not to do to become a successful entrepreneur. In addition to taking ‘controlled risks’, he advised that an entrepreneur should have ‘passion, attitude, focus and persistence’ as well as the ability to be ‘resilient to ups and downs’. Advice through interesting job interview stories, and finding individual strengths were also emphasized and appreciated by all. The evening was wrapped up by a Q&A where students had the opportunity to ask the entrepreneur some thought-provoking questions. Click here to watch the full conversation with Sir Eric Peacock.